Our mission here at Calton Nutrition is to help you to achieve extraordinary health by becoming sufficient in your essential micronutrients (i.e. vitamins, minerals, essential fatty acids and amino acids.) So, some of you may be wondering why we decided to come out with a line of essential oils. Perhaps you’re thinking that we have strayed from our ‘micronutrient sufficiency path’. Well, we assure you that our message has not wavered. While our core products, such as nutreince, SKINNYFat, IN.POWER, and Origin Omega, either deliver or increase the absorption of essential micronutrients, our in.essence line of 5 organic, essential oils (lemon, orange, lemongrass, basil and lavender) help to ensure that these health-enhancing micronutrients are not put in jeopardy from common household toxins. In The Micronutrient Miracle we really focused in on how everyday items in your house could be robing you of essential micronutrients. How? The toxic chemicals found in common household goods, such as moisturizers, air fresheners, dish detergent, cleaning products, laundry cleaners, soaps, candles and dryer sheets all increase your toxic load. What most people don’t know is that essential micronutrients are the body’s primary way to protect and rid itself from these dangerous toxins. That’s right! The same essential micronutrients that you are counting on to preserve your health and protect you from disease can’t do their job, to their maximum potential, when they have to work overtime to detoxify your body. More toxins mean an increased demand on your micronutrients, which leads to a much greater likelihood of becoming micronutrient deficient – and of you becoming sick! The good news is, you can help your body to maintain optimal micronutrient levels by reducing your contact with these household toxins; and that is just the beginning of what our new line of organic essential oils, can help you do. We were actually introduced to essential oils and the amazing benefits they can provide almost by accident. A woman wrote to us who was having a hard time flavoring her nutreince natural (our unflavored/unsweetened multivitamin beverage.) Since she was allergic to the stevia-based flavors we usually recommend, someone she knew suggested that she try a lemon essential oil instead. When she did, she contacted us right away to tell us that she loved it. As you probably know, and as we quickly learnt, there are tons of companies selling essential oils out there… most of which operate by having multiple-levels of incentivized salespeople buy their products and then sell them to their friends and family. And it isn’t just a few people doing this, its hundreds of thousands of people. So, we initially felt a little apprehensive about jumping into this incredibly crowded and competitive space. 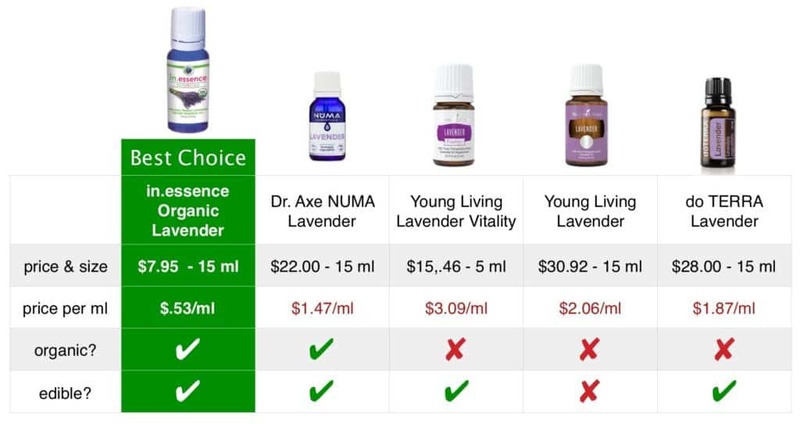 But, as with all of our products, after thoroughly researching the quality and pricing of the essential oils that were currently out on the market we really felt that there was a need for a safer, higher quality, and more affordable product in the marketplace, and that was the birth of our in.essence line of organic, essential oils. First, in.essence allows you to add delicious, organic flavors to nutreince natural, our unflavored and unsweetened multivitamin beverage, making it easier for you to get optimal levels of the vitamins and minerals you need on a daily basis. Let’s face it, if something doesn’t taste good you're probably not going to drink it everyday. Secondly, in.essence helps you retain those health-promoting micronutrients by reducing your exposure to everyday toxins and giving you safe, non-toxic swaps for many of your household products. AND AS A BONUS – just enter the coupon code inessence$5 at checkout to save $5 instantly when you shop here. 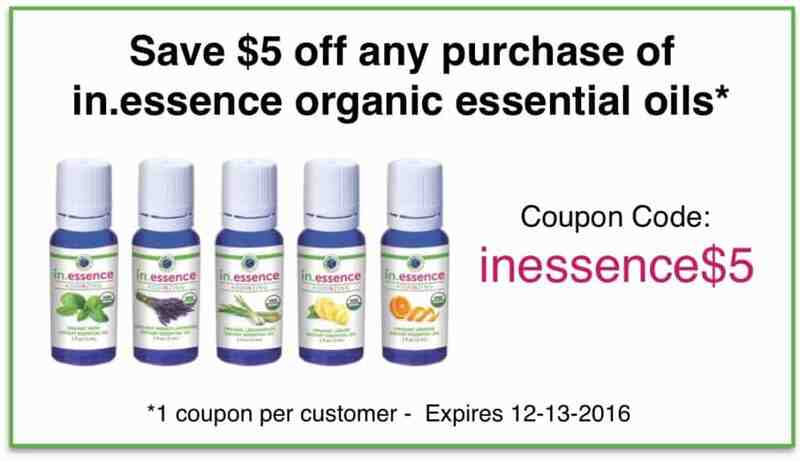 Coupon code inessence$5 is good for $5 off a first purchase of in.essence and expires on December 13, 2016, at midnight. Available for in-stock merchandise only, while supplies last. This offer cannot be combined with other offers or coupon codes. Sorry, no rainchecks. Discount cannot be applied to any previous purchase.